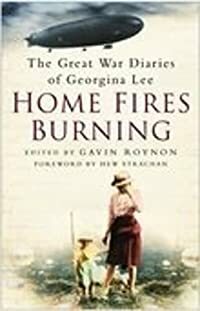 Home Fires Burning The Great War Diaries of Georgina Lee edited by Gavin Roynon turned out to be a good and enlightening read. Georgina Lee was a fairly well-connected upper middle class married lady and at the beginning of World War 1 she had a nine month old son called Harry. She decided to write her wartime diary- addressing it to Harry. The book is split up into eleven sections with section 1 beginning on July 30th 1914 and section 11 ends on November 11th 1919. To begin with I was quite disappointed with this book as the diary entries are very war news heavy and I had expected it to be more about what was going on in her life domestically. I imagine that it might be a bit much for people who aren’t terribly interested in the beginnings and progress of WW1, eventually though Georgina Lee did bring more of her own family’s and neighbours’ experiences into her writing. I ended up really liking her, she had had a priviliged life, she had spent a lot of her life living in France as her father was a successful artist who had settled in France, so she spoke French like a native which was very helpful as she was able to communicate with the Belgian refugees that she ended up working with. She was no snob though and worried about the children of people who weren’t as lucky as her. With several men in her family at the front as well as many friends she was getting first-hand accounts of what was going on there, and passed them on to her son via her diary, presuming that one day he would be interested in the developments. I learned a lot from this book, I had always thought that to begin with men had clamoured to join the army but it seems that things slowed up very quickly and campaigns to get men to join up weren’t very successful. Georgina Lee’s family had an estate in Wales and no Welshmen would join up as they didn’t see why they should fight for England. Not one came forward when her husband gave a speech asking for volunteers. They also had a house in Scotland near Blair Atholl. Later on she mentions that an American girl who had gone over to France to nurse had said that wealthy French ladies never lifted a finger to help with nursing or even the making of bandages. A friend had taken in some Belgian refugees which included a 25 year old man who had no intention of fighting for his country, which must have been very galling. The book has quite a few photos, maps, cartoons, newspaper excerpts, all interesting but more than anything I was surprised by just how often the population was menaced by Zeppelins. At the beginning of the book there’s a map showing all the locations of German air raids over London with hundreds of bombs being dropped with 800 civilians being killed in London in 1917-18 and 1,500 injured. Food was pitifully scarce and the government told people to eat more slowly so they wouldn’t need so much food! The author is scathing about the government – at one point complaining of the £4,000 that the 21 members of the cabinet were getting annually – for being totally incompetent. Plus ca change! As I got towards the end of this book I was wondering what had become of young Harry who was by that time 5 years old, so I was very pleased to see that Georgina Lee’s granddaughter (who used to discuss the diaries with her granny) had written a biographical note telling what had happened to Georgina and her family after the war. Georgina was 96 when she died. I had been doing fairly well with concentrating on reading my own books – until recently. At the moment I have quite a few out and I’m waiting for one to turn up. I need to read The Chalk Pit by Elly Griffiths before going on to read the one that comes after that in her Dr Ruth Galloway series which is – The Dark Angel by Elly Griffiths. Today I just picked up The Grave’s a Fine and Private Place by Alan Bradley, I’m really looking forward to that one. I borrowed The Fair Maid of Perth by Sir Walter Scott, I have an ancient hardback edition of it but the print is teeny and this new Edinburgh edition has loads of explanatory notes which I’m reliably informed are really interesting. The Great War Diaries of Georgina Lee – Home Fires Burning shouted at me from a display in the library so I couldn’t leave the place without it. Christmas at Little Beach Street Bakery by Jenny Colgan is one that I hope will help out with getting me into the Christmas spirit. Sew Your Own Vintage Keepsakes by Lucinda Ganderton has a wide variety of things to make in it but it’s the pattern of the wee rag doll which interests me. I’ve always liked the look of rag dolls so I plan to get around to making one – if I have enough time. The Last one is a book that I’ve already finished. The Sealwoman’s Gift by Sally Magnusson. It was a great read and I hope that she writes some more books. I’ll write about it in another blogpost. That lot should keep me busy although I’ll have to renew some of them as there’s no way I’ll get them all read within three weeks. But in 2019 I’m definitely concentrating on reading my own books – honest!